Eurasian watermilfoil (EWM) is a common aquatic invasive species found in many of our lakes. However, watermilfoil is a diverse group of plants and there can be many different genetic differences within the watermilfoils. 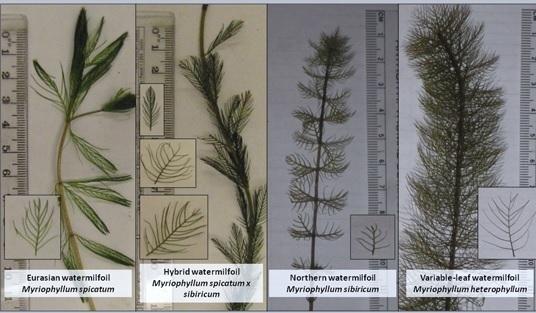 Eurasian Watermilfoil can cross-pollinate and hybridize with native northern watermilfoil known has Hybrid Watermilfoil (HWM). These hybrid species can then cross-pollinate with the numerous milfoil species. Even waterbodies that are close to one another may have unique genetic strains of watermilfoil. HWM is of concern because it may grow more aggressively and may be more tolerant to commonly used herbicides. HWM cannot be identified in the field as it can contain a mix of characteristics from both the Eurasian and Native watermilfoil. The only way to confirm HWM is through genetic testing. A recent study titled Evaluation of large-scale low-concentration 2,4-D treatments for Eurasian and hybrid watermilfoil control across multiple Wisconsin lakes was published in Lake and Reservoir Management by Nault et al. This study looked at 23 lakes in Wisconsin pre and post a 2,4-D treatment. The researchers were looking at how 2,4-D dissipates and moves throughout the water as well as how well it worked to control EWM and HWM. 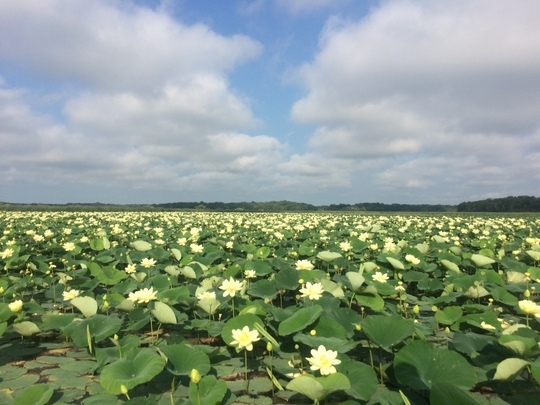 The study showed that herbicides move quickly off of treatment areas, which is important for lake managers to understand and consider as they are planning for lake treatments. According to the study, if the percentage of treated areas to overall lake surface area is >5% and the targeted areas are treated at relatively high 2,4-D concentrations (2-4 ppm), then there is increased chance for dissipation of concentrations that could have a lake-wide impact. In the 23 lakes studied, there was better control on the lakes that contained pure EWM. Previous research has also shown that HWM may be more resistant to 2,4-D than EWM. The study also showed that several native plant species showed a decline during the first year post-treatment. The species most significantly impacted were: Northern Watermilfoil, Slender Naiad, Water Marigold, several pondweeds (Illinois, Flat-stem, Sago etc.) and Water Stargrass. This study provides good insight for lake managers. Understanding what genetic type of watermilfoil is present in the lake, how 2,4-D can dissipate off a treatment site, and potential impacts to native plant species are important factors to take into consideration when planning for a lake treatment. American Gizzard Shad (Dorosoma cepedianum) are native to central and eastern United States mainly in warm low gradient rivers and streams as well as reservoirs, lakes and ponds. Shad are filter feeders preferring warm nutrient rich waters. Their range is temperature limited. Die offs usually occur when the water temperature drops below 37°F. Shad can extend their range during a string of warm years; the Illinois DNR collected its first sample of gizzard shad in the Fox Chain O‘ Lakes in 2007. It's likely these shad migrated up the Fox River over fish ladders and dams to make it to the Chain. Lakes that receive flood waters from the Des Plaines River can also have them. While most shad live for 3-5 years, some have been documented to live past 10 years. They reach maturity in 2-3 years and females can produce between 40,000 to 450,000 eggs. Spawning takes place during the middle of spring to early summer and usually occurs in the evening. The preferred spawning temperature is between 60°F and 70°F. Male and female shad congregate along the shallow sandy or gravel areas where eggs are released and fertilized. The success of the shad fry correlates with the abundance of zooplankton along with stable water level and warmer temperatures. Drastic changes in water level and temperature can decrease the survival rate of the fry. Once they reach the juvenile stage, they grow rapidly by feeding mostly on phytoplankton and zooplankton. At this stage they develop a 'gizzard' and begin filter feeding for food. Sediment and sand are also ingested by the gizzard shad that helps it to digest food. It's muscular gizzard; this is where the fish gets its name. Fishermen on the Fox Chain O‘ Lakes have seen large schools of shad swimming in the shallow weedy bays. While they are rarely caught with the traditional hook and line, most anglers inadvertently snag shad with their hook or lure while targeting game fish. Gizzard shad provide an abundant food source for bass and walleye, but they may compete with bluegill, crappies and other young of the year game-fish for food. Shad have rapid growth rates, often growing 5.5 inches in length during their first year. This provides a smaller window of opportunity for bass and walleyes which are gape limited, meaning they are limited by their mouth size, and can only feed effectively on shad up to 6". The lakes and rivers in southern states have an over abundance of adult shad measuring 8" or larger due to lack of predators. Fortunately, the Chain has a healthy population of muskies, which are capable of feeding on adult shad. Muskies have benefited from this new food source which is not only abundant but it‘s easier for them to catch than bluegills or perch. The less energy a fish spends chasing its prey the more energy it saves for growing. Gizzard shad can alter the size and density structure of a fishery. They may stunt the bluegill population through common food competition or by reducing the predation pressure. This allows for higher recruitment which leads to stunted population. Bass may grow larger due to having more food available for them to eat, but their fry may have to compete for food. At this point it is hard to predict what the overall outcome of the gizzard shad will be on the fishery. At least for now, it gives fishermen hope that the shad will help produce record size game fish. This presentation will be led by Bob Kirschner, Curator of Aquatic Plant & Urban Lake Studies and Director of Restoration Ecology, Chicago Botanic Garden. Let’s face it: native plantings along the edges of lakes and streams are sometimes viewed as being too messy and “weedy”—as compared to a more typical home landscape where foliage color, abundance of flowers, and seasonal interest are all considered important. Thoughtful integration of such “gardening” aesthetics into riparian landscapes, together with defining features such as pathways and edging, combine to create visual “cues to care” that reinforce the landscape’s intention while still providing considerable ecological benefit to the waterway. We’ll take a look at how thoughtful design and careful selection of native plants can turn shoreline landscapes into ones that enhance water quality and habitat—AND are the envy of your neighbors! Frank Jakubicek, IDNR District Fisheries Biologist for Lake and Cook County, will speak about carp, their impact on lake and river habitats, and strategies for their management and control. The common carp, first imported into the U.S. in the 1850's, are pervasive and now are considered "native." Frank has dealt with carp issues for years, and will share his perspectives on carp control from both a biological perspective and a management perspective, noting which measures work, under what conditions, and for how long. Come, gain insights into how to manage these fish that tear up our relatively shallow, soft-bottomed lakes, increasing turbidity, uprooting beneficial aquatic plant life, creating tough living conditions for game fish, and complicating lake and stream management for all of us. Join the Lake County Health Department and Illinois Lakes Management Association (ILMA) for an aquatic plant identification workshop. Participants will learn to identify native and invasive plants in their lake with hands on identification. The workshop will include real-plant ID on rooted floating vegetation, non-rooted floating vegetation, and submerged vegetation. An RSVP is required. RSVP to Alana Bartolai at abartolai2@lakecountyil.gov or (847) 377-8009. The Lake County Health Department-Ecological Services (LCHD-ES) and the Chicago Metropolitan Agency for Planning (CMAP) has hosted a couple Lake Management Planning Workshops. There are many components that go into creating a Lake Management Plan for your lake. 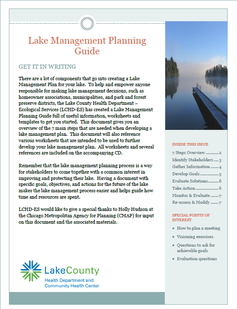 To help and empower anyone responsible for making lake management decisions, such as homeowner associations, municipalities, and park and forest preserve districts, LCHD and CMAP has created a Lake Management Planning Guide full of useful information, worksheets and templates. Can You Name This Aquatic Macrophyte? Think you know the answer? Email your best guess to ABartolai2@lakecountyil.gov.